A Pancake and Sausage Breakfast Benefit for Bonnie Diederich of Murdock is planned for Sunday, July 24, 2011 from 8 a.m. to noon, at the Murdock City Hall in Murdock, Minnesota. Bonnie died of cancer July 7, 2011. There is a free will donation for the breakfast, along with a silent auction. For more details, contact Carmen Froehlich, 320-875-2185, or Bonnie Wentzel, 320-875-4569. 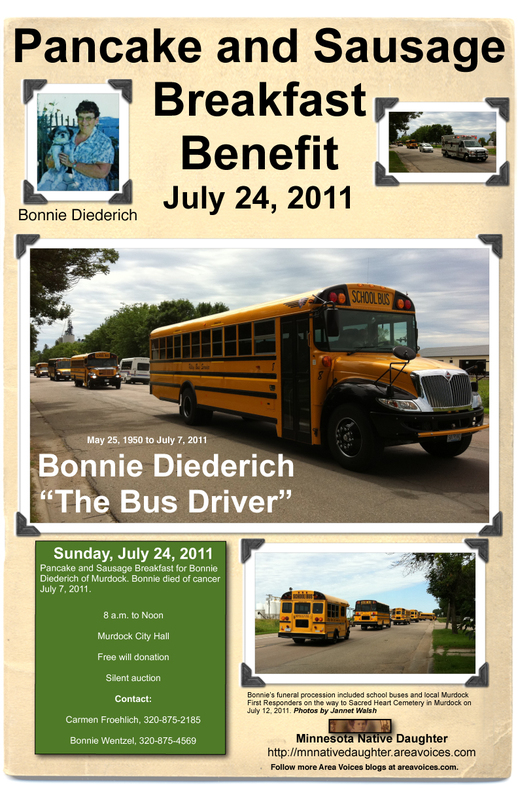 Bonnie’s funeral procession included school buses and local Murdock First Responders on the way to Sacred Heart Cemetery in Murdock on July 12, 2011. (Photos by Jannet Walsh) Click here to download photos. Click here to download high resolution poster. 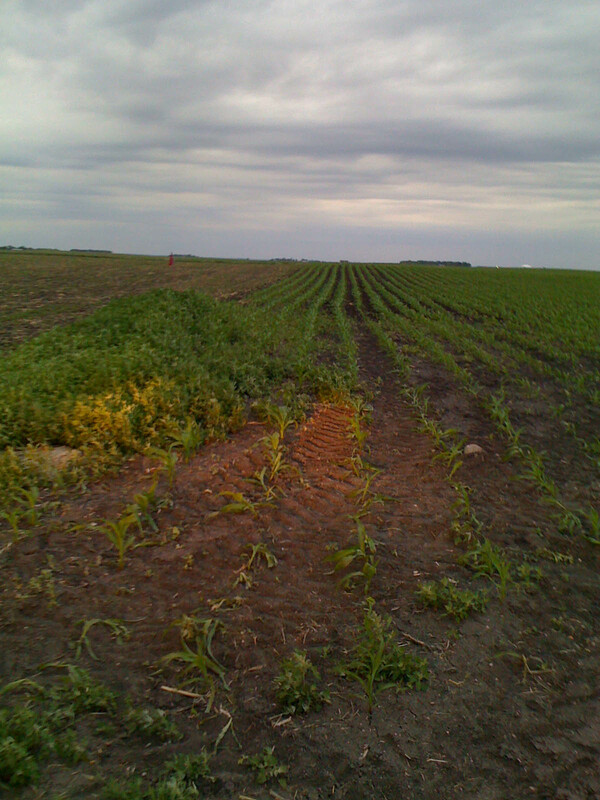 This entry was posted in Family, Genealogy, Minnesota, Minnesota Native Daughter, Murdock, News, rural and tagged family, Genealogy, Murdock News, news, religion, Rural on July 12, 2011 by Jannet Walsh. My father remembered, Martin J. Walsh Jr.
Read related blog about my father’s travels as a young man in Europe on the SS United States. 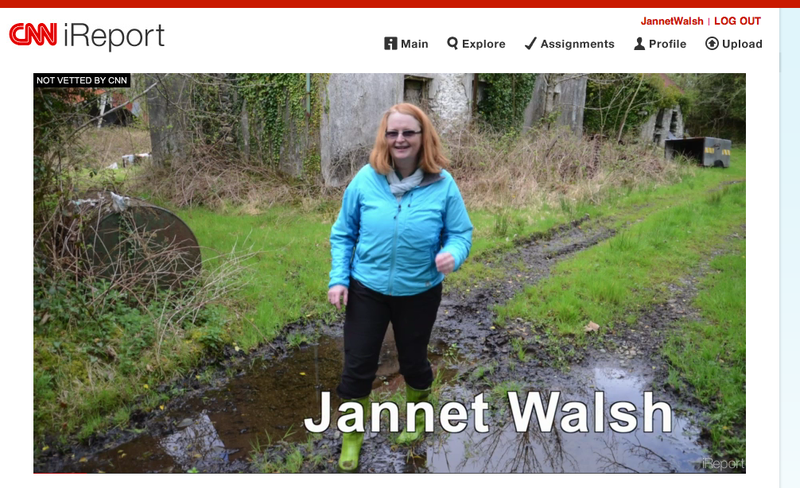 Click here to view poster at jannetwalsh.com. 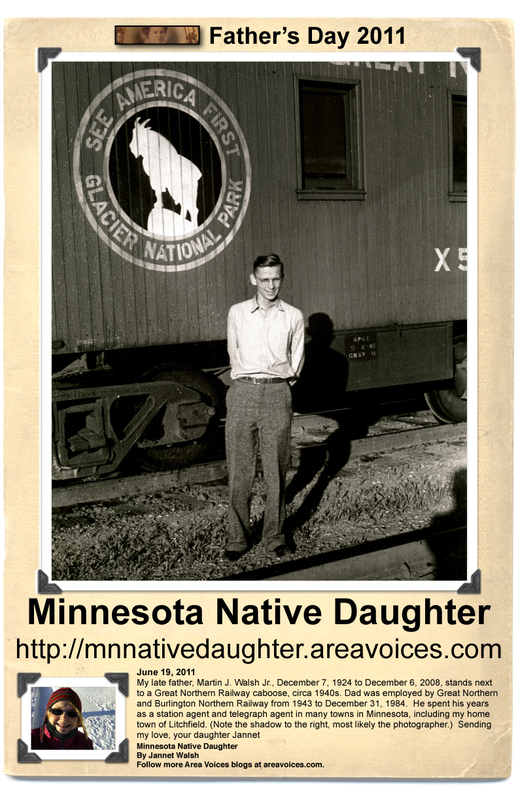 Click here to download photo of Minnesota Native Daughter Father’s Day poster. You can print or save to desktop. Mass of Christian burial for Martin J. Walsh, Jr., 83, of Bennett, WI (formerly of Murdock) was 10:30 a.m., Thurs., Dec.11 at Sacred Heart Catholic Church in Murdock with Fr. John Pearson officiating. Burial was in the Sacred Heart Cemetery, Murdock. He died Saturday, Dec. 6, 2008, at St. Luke’s Hospital in Duluth. Martin John Walsh Jr., was born December 7, 1924, in Murdock, the son of Martin J., Sr. and Jannet “Jennie” (Foley) Walsh. He was baptized and confirmed at Sacred Heart Catholic Church in Murdock. He grew up in Murdock and graduated from Murdock High School with the Class of 1942. He went on to attend St. Thomas University in St. Paul. Martin was employed by Great Northern/Burlington Northern Railway from 1943 to December 31, 1984. He spent his years as a station agent and telegraph agent in many different towns. He lived in Minneapolis at the time of his retirement, where he enjoyed volunteering at the St. Stephens Catholic Church. He was a lifetime member of the Knights of Columbus 2029 in Litchfield. Among the things he enjoyed were traveling by train, photography, coin and stamp collecting, listening to jazz and polka music. He enjoyed playing the trumpet. Preceding him in death were his infant son, David Walsh; his parents, Martin, Sr. and Jennie; and a sister, Mary Agnes Shopa. Do you have a railroad memory? Let me know at jwalsh@wctrib.com. This entry was posted in Blogging, Family, Genealogy, Martin Walsh, Minnesota, Minnesota Native Daughter, Murdock, News and tagged family, Minnesota Native Daughter, Murdock, Murdock News, religion, Rural on June 19, 2011 by Jannet Walsh. 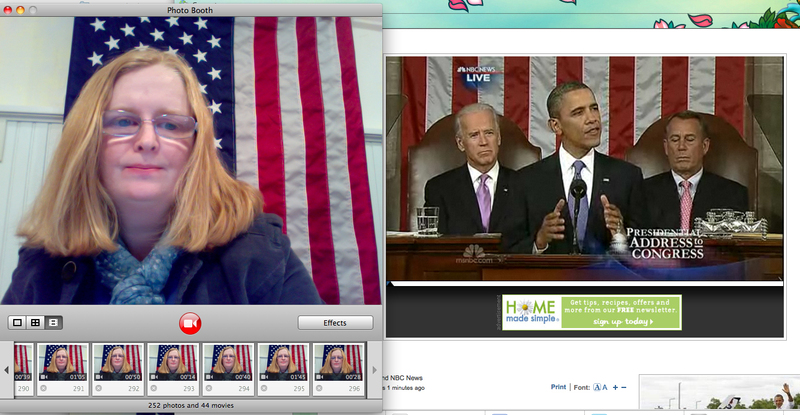 Here is my latest stumble. I just found an online book from Google Books you can read online about the colonization in Swift County. I looked quickly at the book yesterday and found a reference about the Swift County land for the farmers was set aside for the poor and homeless, not for Minnesota farmers that already had land. They were talking about my family and the other Europeans during that period that needed land and place to call home. My family has been here since that time. In the years 1875 and 1876 the late Archbishop John Ireland started a Catholic colony adjacent to Murdock and DeGraff, the very location my family still has a farm. A church was first built in DeGraff, St. Bridget parish. The people in Murdock did not have a way to travel to DeGraff, so a second parish was started as a mission church of DeGraff in 1894 in Murdock, now know as Sacred Heart. 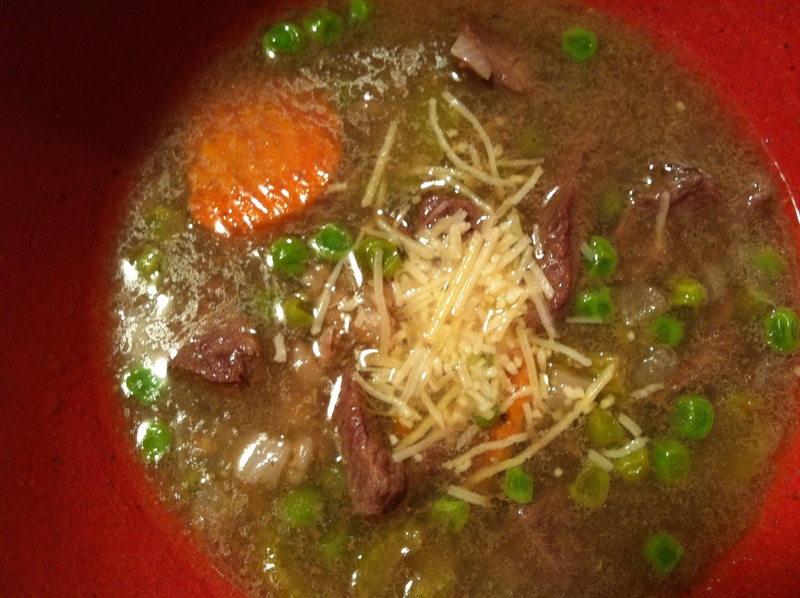 Click to view tracing your Irish roots blog. 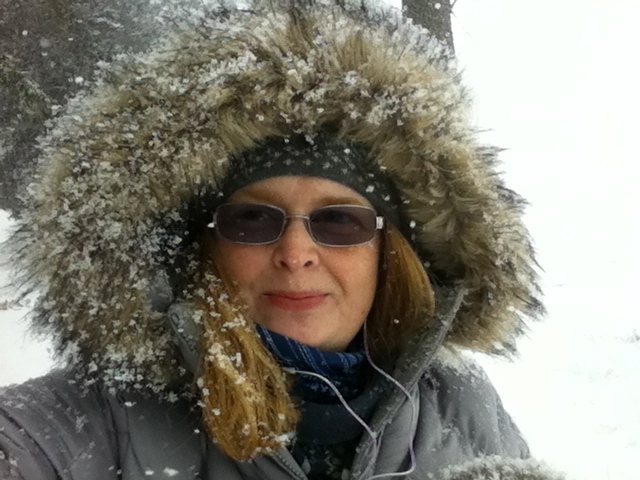 This entry was posted in Blogging, Family, Genealogy, Martin Walsh, Minnesota, Minnesota Native Daughter, Murdock, Stephen Foley Family and tagged De Graff, family, Genealogy, Minnesota Native Daughter, Murdock, religion, Stephen Foley Family on February 17, 2011 by Jannet Walsh. I recently wrote Michael Lynch, Archivist from Kerry Library, located in County Kerry, Ireland for traces and clues about my family. Lynch was able to help me more than I could have dreamed. There are many missing links, but great clues to where my family originated from in Ireland with the help of Roman Catholic Records. The Diocese of Kerry in Ireland has a great online link, with church records surviving up to about 1900, are online and free. 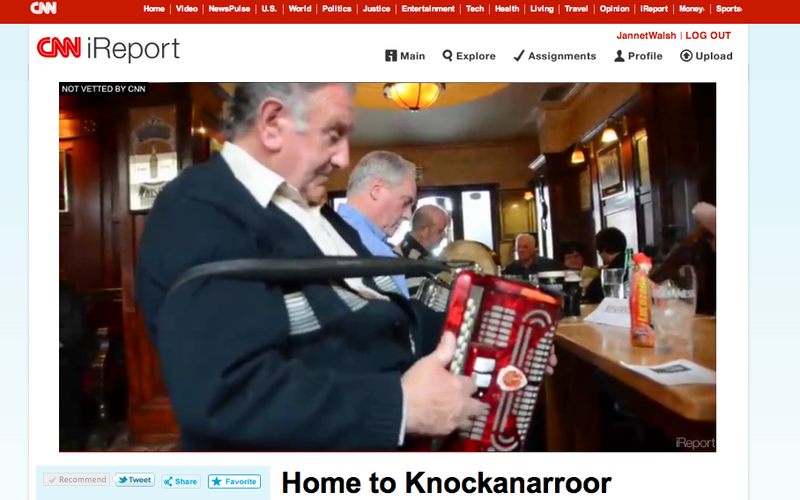 Of the interesting facts, it is likely my Great-Great Grandmother Ellen Brennan Foley was from Knockanarroor townland, which is situated about 5 miles East of Killarney town. The relevant Catholic Parish is Glenflesk. A townland or bally is a small geographical division of land in Ireland. 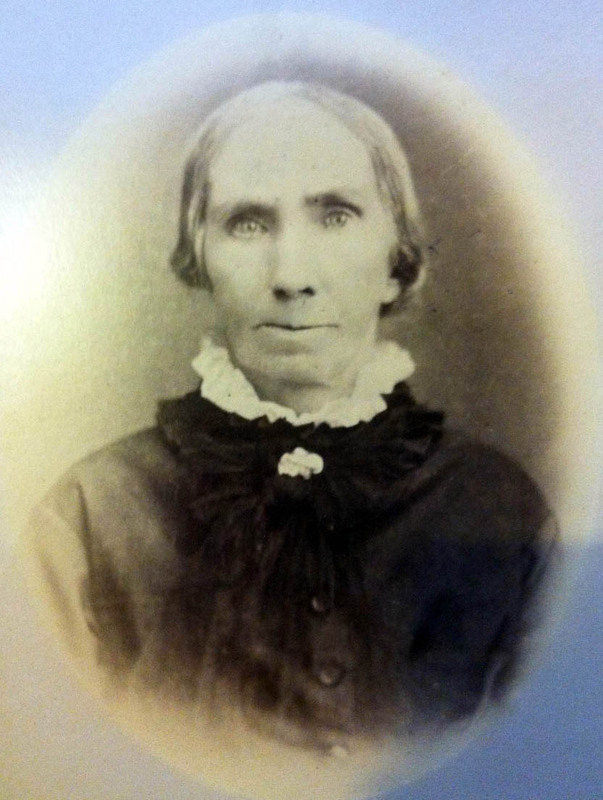 Ellen Brennan Foley was born May 15, 1820 in Kilarney, Ireland the daughter of James Brennan, 1793-1863, and Mary Walsh, birth and death unknown. 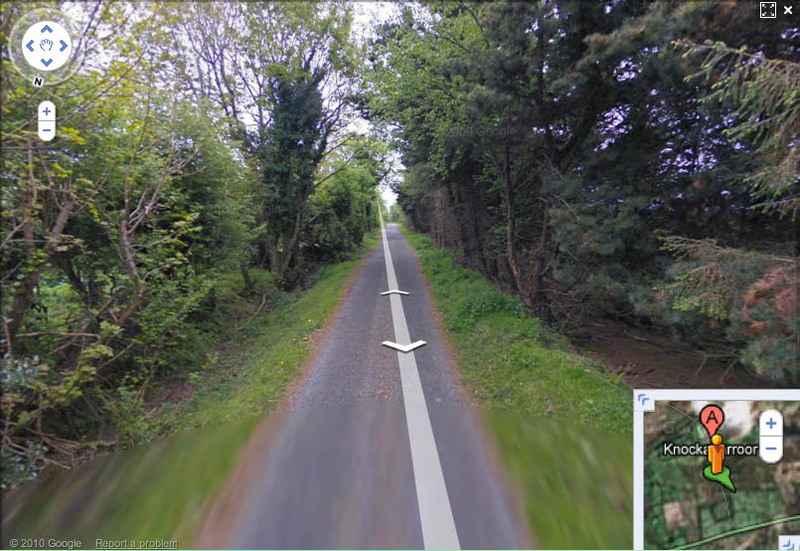 Click here to see link of street level of Knockanarroor, Ireland. James Brennan and Mary Walsh, possibly had children named John (16 July 1826), Daniel (30 August 1832), and Charles (1 November 1836). An Ellen Brennan is listed as a sponsor to a baptism, and may be an elder sister to the child. The family address for this family is given as Knockanarroor townland, which is situated about 5 miles East of Killarney town. The relevant Catholic Parish is Glenflesk, for which records survive back to 1820. However, all available records only give 13 entries for baptisms in 1820 in this parish, and Ellen Brennan is not among them. In fact, there are no Brennan baptisms recorded in that year for Glenflesk. The International Genealogical Index, IGI, and Oâ€™Kief parish record listings record the Charles in 1836 as James, with a baptismal date of 13 November 1836. The listed sponsors are again Ellen Brennan and Denis Sullivan. These listings also record a Daniel baptized on 18 July 1829. He must have died in infancy. Glenflesk marriage records only date from 1831, so that there is no prospect of finding a record of the marriage of James Brennan and Mary Walsh. 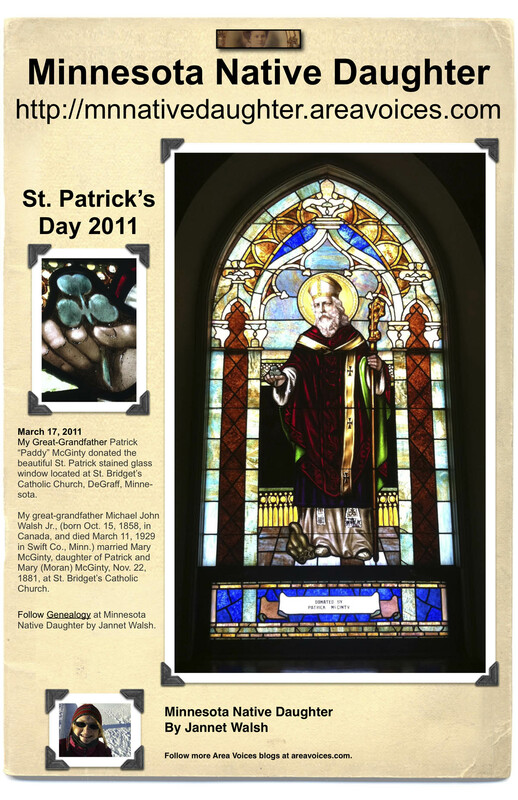 This entry was posted in Blogging, Family, Genealogy, Minnesota, Minnesota Native Daughter, Murdock, Stephen Foley Family and tagged blogging, Catholic, family, Genealogy, Irish, Jannet Walsh, Minnesota Native Daughter, Murdock, religion on February 15, 2011 by Jannet Walsh.